James Clayton Dykes, one of the most colorful managers in the history of professional wrestling, has died. J.C. Dykes, who gained notoriety as manager of the infamous Masked Infernos, passed away of a heart attack at the age of 67 on Nov. 20 in Cleveland, Tenn.
Dykes began his career as a referee for promoters Roy Welch and Nick Gulas in Tennessee and Alabama in the early ’60s. He began managing The Infernos in 1964. Dykes and The Infernos were one of the top attractions for the Charlotte-based Crockett Promotions in the late ’60s. They were involved in major feuds with such teams as The Scott Brothers, George Becker and Johnny Weaver, and Nelson Royal and Tex McKenzie. They also engaged in money-making ” battle of the bullies” bouts with Rip Hawk and Swede Hanson, Aldo Bogni and Bronco Lubich, and The Andersons. The colorful trio were known for their assortment of gimmicks – the red-headed, tuxedo-clad Dykes with his whistle and controversial canteen, the ” fireball” Inferno with his mysterious flame, and the ” clubfoot” Inferno with his ever-present loaded boot. The original Infernos consisted of Frankie Cain and Jimmy “Rocky” Smith, but later members included Karl Von Brauner and Doug “The Professional” Gilbert. The team won numerous titles in the Carolinas and Virginia, Georgia, Florida and Texas, and made several tours of Europe and Japan. Dykes, who donned the wrestling tights on occasion, was involved in classic feuds with Mario Galento, Leo Garibaldi and former boxing champion Joe Louis. Dykes also managed the team of Don and John (Greg Valentine) Fargo in West Texas in 1973. He brought a new team known as The Dominoes into Tennessee in 1976, with Frankie Hester and Cliff Lilly behind the masks. Lilly was later replaced in his role by Pepe Lopez. Dykes quit the business after a fatal car accident July 26, 1976, in which Hester, Lopez and Sam Bass (manager of Jerry Lawler) were killed. Dykes drowned his sorrow in the bottle following the accident, but he became a born-again Christian during a revival service on Jan. 6, 1977. [ad#MikeMooneyham-336×280]Dykes had spent the last years of his life with his wife on a mountain he owned near Cleveland, Tenn. He operated a company that specialized in sandblasting, paint restoration and brick cleaning. The focus of his life, however, was working for the Lord. He was a member of Waterville Baptist Church in Cleveland, where he was involved in lay revivals with the Southern Baptist Association, and was instrumental in helping start churches, organizing relief teams to help with flooding and hurricane victims, and organizing a successful jail and prison ministry. He served as chaplain for the Bradley County Justice Center for 16 years and was a member of Gideons International. Herb Conley, who worked with Dykes for the past 10 years in the jail ministry, told The Cleveland Banner that plans are to keep the Bold Going Ministries going as well as they can without his special friend. “It will be a lot of work, but we are definitely going to keep it going,” Conley said. Bold Going Ministries includes some 50 or so volunteers who travel to area jails and other sites to minister the word of God, and to serve as counselors to many who just need someone to talk to. Dykes himself had been presented awards for the ministry in the past. Bradley County Sheriff Dan Gilley told The Banner that Dykes will be deeply missed. West recalled The Infernos as one of the top-drawing teams in the sport during their heyday. “They really drew some money,” said West. ” They were probably one of the hottest teams around during that period. They knew what the other one was doing at all times. Frankie (Cain) used the fire more than J.C. or anybody else did. He had that fire right down pat. 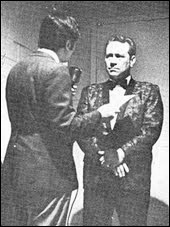 And he continued to use it years later in Florida as The Great Mephisto.” Cain, long removed from the wrestling business, now runs a night club in Fort Walton Beach, Fla. Smith died of a heart attack a number of years ago. West also recalled an incident that may have led to Dykes’ eventual health problems. “On the night of the accident, I decided to ride back from Memphis with Pat Malone. I remember patting the top of Sam’s (Bass) car before we left and saying, `Drive carefully.’ As we came into Jackson (Tenn.), word came over the CB that a drunk was on the road. At the Little Piney River bridge, near Dickson, the traffic had come to a dead stop. We could see a huge fire across the bridge and people on the CB were talking about a wreck. “The drunk had hit the bridge, taking out about 40 feet of the concrete railing, and was sitting on the road with no lights. Sam hit the car and a big truck, which Sam had just passed, plowed into them both. “When reports came over the radio that three wrestlers were involved, I walked down to the bridge and could see wrestling uniforms and boots scattered all over the road. Then I recognized their suitcases and knew it was my men. ” A young man, who had been to the matches that night, told me the state highway patrolman thought it was me in the car. I crossed the median and told the patrolman who I was. When I told him that the driver was Sam Bass, he pulled a clipboard from his dashboard and the accident fatality report had my name on it. “After I straightened him out, and traffic got moving, I returned home. I laid down beside the driveway on our picnic table and I broke. I began to weep, which was something I hadn’t done in years, because I had been hardened over the years. “I’d been a drinker before that, but I began to drink more than I ever had. I guess because of the sorrow. My wife began to bug me about going to church. I had always refused to go, but I remembered that if I hadn’t decided to ride with Pat and help keep him awake, I would have died in that car. I started to think about the direction my life was taking. “That was in July, and in September, I went to church and saw things that I liked. People filled with joy and good fellowship. On Jan. 6, 1976, the preacher was preaching from Matthew 11:28-30, where Jesus said, `Come to me, ye who are heavy laden, and I will give you rest.’ I’d run from God all my life and I was hurting so bad. I was having problems at every turn … a troubled marriage, heavy drinking and the sorrow that came with remembering the accident. That morning, I asked for that rest and became a new man.